Police Chief David Roddy answers a councilor's question during a City Council work session at the Chattanooga City Council building on Tuesday, Jan. 29, 2019, in Chattanooga, Tenn. Chief Roddy explained the departments policies for officer discipline and answered questions from councilors after a video depicting an officer punching a suspect was released earlier this month. As Tennessee lawmakers began pushing last week to restrict police oversight board power, some Chattanooga leaders suggested putting the issue up for a local vote in the 2020 election. 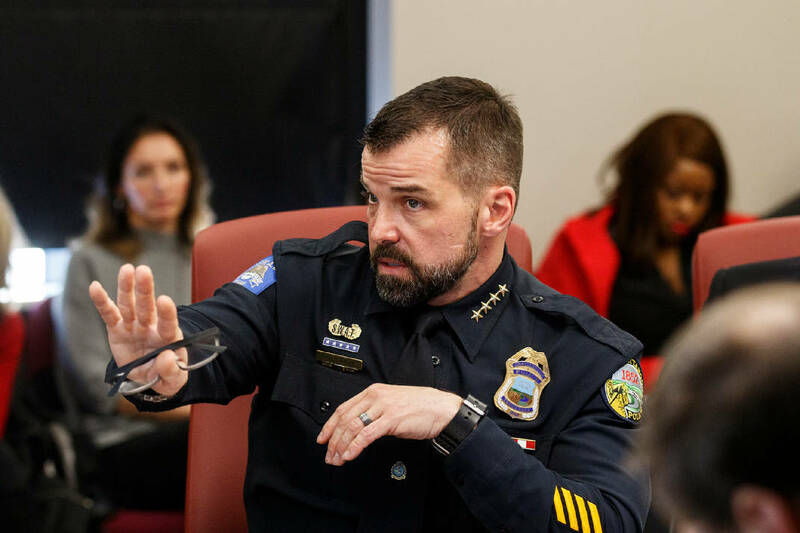 City council members Anthony Byrd, Demetrus Coonrod and others discussed adding a police oversight referendum on the ballot during a strategic meeting Tuesday with police Chief David Roddy present. If Chattanoogans voted in support, the oversight board would become part of the city charter, making it harder for future mayors or police chiefs to scrap it. But at this point, it's unclear how the board would look or operate: Commissioners aren't sure if they want to create an entirely new board with subpoena power or tweak an existing board by appointing their own representatives to it. Some declined to comment or return calls for this article, but they will meet with Roddy again on Feb. 19 and continue studying other police oversight models, including ones in Knoxville, Memphis and Nashville. "I can only speak for me, [but] I want it to go on the ballot, have the people vote on it, and the next election is 2020, so I'm pushing to prepare the legislation to get that done," said Byrd, whose district includes Avondale, Bushtown and other East Chattanooga communities. The council's discussion comes as Chattanooga grapples with a handful of alleged police brutality videos and as Tennessee Republican lawmakers push a bill to strip police oversight boards statewide of their subpoena power and other elements. Some have speculated the bill was in response to Nashville's oversight board, which citizens voted to add to the city's charter last fall despite a push by police unions to quash it. Republican leaders have denied that suggestion. In Chattanooga, Roddy told council members change is needed after a video of one of his officers punching and cursing a motorist during a March 2018 traffic stop emerged last month. He said the department added an internal affairs investigator and is adding another sergeant to the professional standards division. That sergeant will be responsible for reviewing and submitting reports on all body-worn and in-car video connected to use-of-force reports. He also offered to work with the council on how to develop a better Administrative Review Committee, which is the city's only existing form of police oversight that's used in the internal affairs process. When officers are accused of misconduct, internal affairs investigators try to interview all involved parties, watch all body camera video and gather any facts. Their supervisors then recommend a punishment, and that recommendation goes to the Administrative Review Committee, or ARC, which consists of three citizens, three police officers and an assistant police chief. The ARC gets to review all the evidence — but must promise not to release it — and has the power to disagree with internal affairs and suggest a harsher — or lighter — punishment. The complaint then travels up the police department's chain of command, with Roddy having the ultimate say on discipline. Because government employees have more due process and civil service rights, and can use a perceived violation in the disciplinary process to challenge their punishment and possibly get their job back, Roddy has encouraged the council to let that process play out. But community members and oversight boards say this model of police policing themselves doesn't weed out misbehaving officers and isn't transparent. Some say they want local legislation that makes any oversight board independent of the police department. Otherwise, the city will only be tweaking the ARC committee, which they say isn't strong enough to effect change. "Currently, the council is trying to fast-track [an] effort that will seemingly reaffirm or tweak the existing and ineffective Administrative Review Committee," Concerned Citizens for Justice, a social advocacy nonprofit, said in a statement Friday. "Furthermore, while the City Council and City staff play catch-up on looking at different models of civilian oversight community organizers and 'activists' have been already been studying different models and looking at legal aspects for years." How would a more independent community oversight board look and operate? The Nashville board is its own department, receives funding from the city, gets to appoint the majority of its members and dictate that they be non-law enforcement, and doesn't start its own investigation into an incident until police finish theirs. For now, the board can subpoena for documents and officer testimony, and will make its findings and recommended punishments public. The police chief can still disagree with the recommendation but must file a written response for the record, said Theeda Murphy, an organizer with Community Oversight Now in Nashville. The organization is having its first meeting next week and, in response to the Legislature's bill, told top high-school athletes to withdraw their support from Tennessee universities or teams. "We would not ask for records during an open investigation," Murphy said. "So that's why [the governor and legislature's] concern that we would be thwarting due process is unwarranted. Our processes would not kick in until the police department's is done." Chattanooga police spokeswoman Elisa Myzal said in an emailed statement that it would be premature for Roddy to comment on whether he would support the Nashville model or whether he prefers modifying the ARC in Chattanooga or creating something different. "Oversight can come in many different forms and that is why the Chattanooga Police Department is having discussions with City Council members who are working with community members to gather input on what an oversight board could look like in Chattanooga," she said. Chattanooga Mayor Andy Berke said he is open to suggestions about how to improve accountability and maintain trust. "For these improvements to be lasting and meaningful, they must be developed locally and collaboratively. I look forward to more conversations about this with members of the City Council, community leaders, and law enforcement," he said in a statement. "I also invite our state legislators to the conversation, not to dictate policy from Nashville, but to help Chattanooga do what's best for Chattanooga." Models do differ across the state: In Knoxville, the board has subpoena power but says it hasn't had to use it because of the police chief's cooperation. In Memphis, the board relaunched in 2016, but two years later, news reports show, members called it a "dog and pony show" because the police chief didn't implement any of its recommendations.